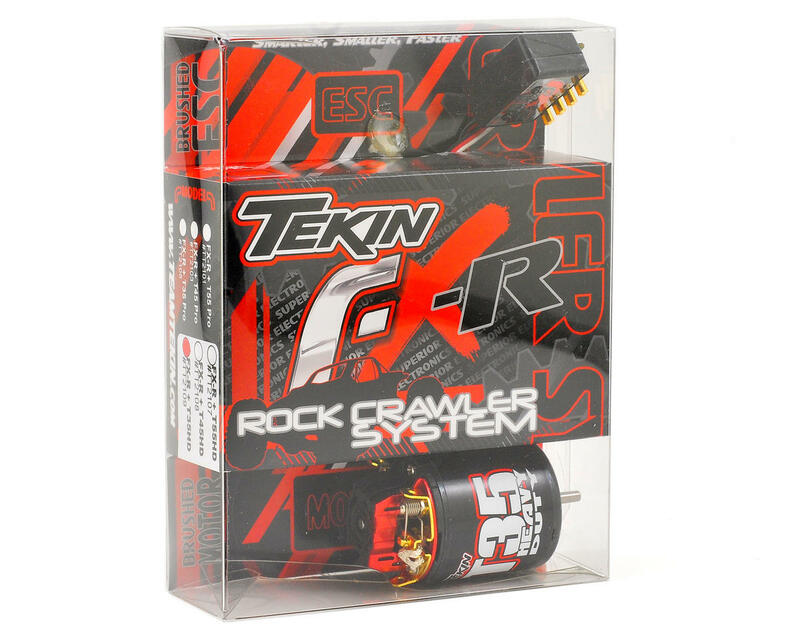 This is the Tekin FX-R Rock Crawling ESC and 35 Turn "Heavy Duty" T-Series Brushed Motor Combo. The FX-R reversing speed controller is the industry leader in pure rock crawling performance. With its tiny footprint, improved drag brake resolution with lock-down holding power, adjustable reverse type with reverse delay, no reverse or instant reverse, as well as ultra smooth low speed creep and precision throttle and braking response, the FX-R gives you an edge over the competition. The FX-R has thousands of possible settings right on-board with Tekin's QuickTune Programming and is capable of extensive tuning and updating when used with Tekin's HotWire PC Interface (*not included). 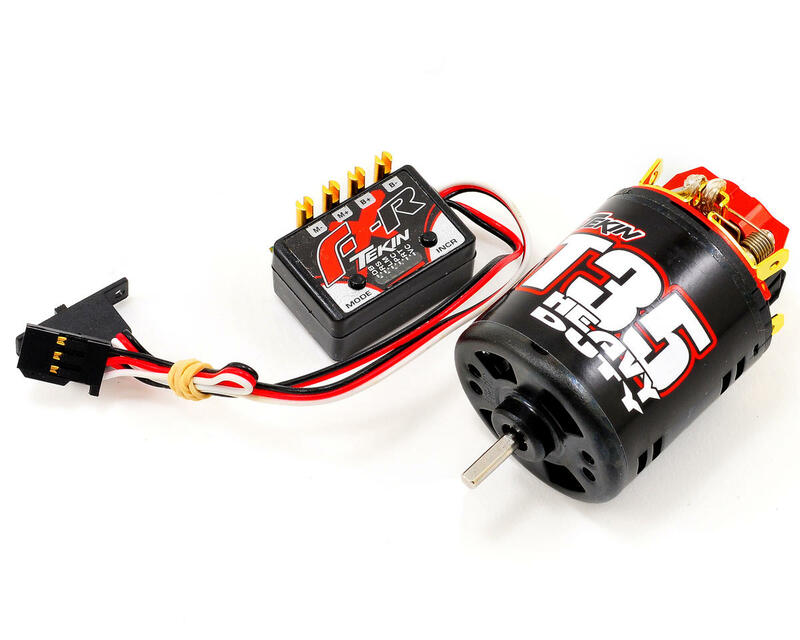 The FX-R can also take on your power needs with 3S Li-Po compatibility when used with 35 turn or higher motors. Install the FX-R and step up to smarter, smaller, faster electronics. Installed this combo into my Axail Wraith, can't really compare it to the Atomic brushed combo that it replaced. But I can say it really makes a difference in crawling for me. The only setting I have adjusted so far is the Drag break, with only a little increase I am now able to hold the Wraith steady on the rocks when I let the throttle return to neutral. It has plenty of torque for powering over and up obstacles. And enough RPM to goose it out of spots where the Wraith is stuck high centered, or the wheels are free spinning. The control is smooth enough for me, both forward and in reverse. I keep everything away from water too, so I can't really say anything about durability, I have considered water proofing the ESC after any implied warranty expires. This is a good purchase for any beginner like myself, I also own a Tekin RX8 motor combo for my Ten SCTE and am very pleased with that too. Es el primer combo de este tipo que compro y estoy muy contento y satisfecho. Es muy suave al arrancar mucho torque y silencioso. Muy facil de programar, haciendolo muy versatil por todas las configuraciones que trae de fabrica. No lo he probado en agua aunque tengo CES protegido contra agua. Lo uso en mi Axial Dingo. Amo Amain..... Amo Tekin...Lo recomiendo 100%. Personally I haven't had a lot of luck and its a bit jerky when your going slow, also it hates water and wears out the brushes very fast, I also put a 25 tooth pinion on to get a bit more speed and it gets the motor way too hot and starts to smoke, I have had it in my wraith for about 4 months and if I were to do the build again I would use a sensored 4 pole brushless motor.